This recipe is inspired by my grandmother who would always make her famous German potato salad whenever we came to visit her farm in the summers. It's not your average mayo-heavy potato salad. Instead, I use a simple mustard vinaigrette which gets soaked up by the potatoes making them super flavorful. The cucumbers add a nice refreshing crunch to balance the starchy potatoes. This salad will be your new go-to side dish for parties and barbecues! What kind of potatoes are best for potato salad? You want to use potatoes that are waxy and less starchy, such as new potatoes, red potatoes and fingerling potatoes. These potatoes will hold their shape much better than their starchy family members! How do you make homemade potato salad? Homemade potato salad is so much tastier and more nutritious than your average store-bought version. All you have to do is boil potatoes, let them cool enough to handle, then slice them thinly. Add to a bowl and toss with a vinaigrette to soak up the flavors. Add in any mix-ins like cucumber, celery, radish, nuts, herbs, etc... Toss with more dressing and serve! A lot of people think potatoes are empty carbs and provide little nutrition value. 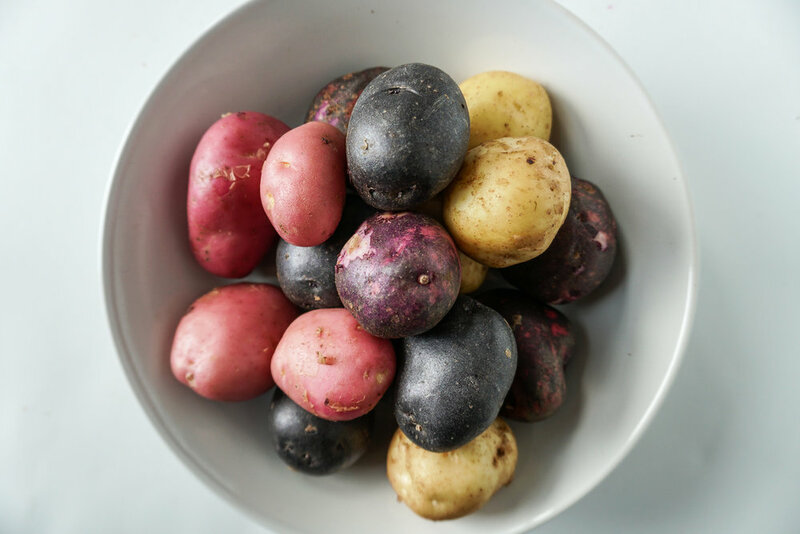 You might be surprised to know that potatoes are rich in vitamins C and B6 as well as micronutrients like magnesium, manganese and phosphorous. In a large pot, add the potatoes, enough water to cover them by 2 inches and a generous douse of salt. Bring to a boil, then reduce the heat and simmer for 10 minutes, or until easily pierced with a knife (this will depend on the size of your potato). Drain and rinse the potatoes quickly with cold water so they are still hot but cool enough to handle. While the potatoes cook, make the dressing by whisking together the olive oil, apple cider vinegar, mustard, shallot and salt in a small bowl. Once the potatoes have cooled enough to handle but are still warm, slice them into thin rounds and add to a large bowl. Pour half of the dressing over the warm potatoes and gently toss to coat. Let them soak up the dressing for 10 minutes. Add in the cucumber, walnuts, dill and remaining dressing. Toss everything together to coat. Taste an add more salt or vinegar if needed. Do your best not to over or undercook the potatoes. You want a knife to be able to slide in with a tiny bit of resistance. It's not the end of the world if you overcook, it will just be a little bit softer and might not hold together as easily, but still delicious! It's essential that you add half of the dressing to the sliced potatoes when they are still warm. Letting them soak up the liquid really boosts the flavor. Always start cooking potatoes in cold water for even cooking results. The salad will keep in the fridge for up to 5 days. If making it a day ahead, make sure to taste the salad before serving. Often it will need a splash of vinegar and some salt to wake it up! 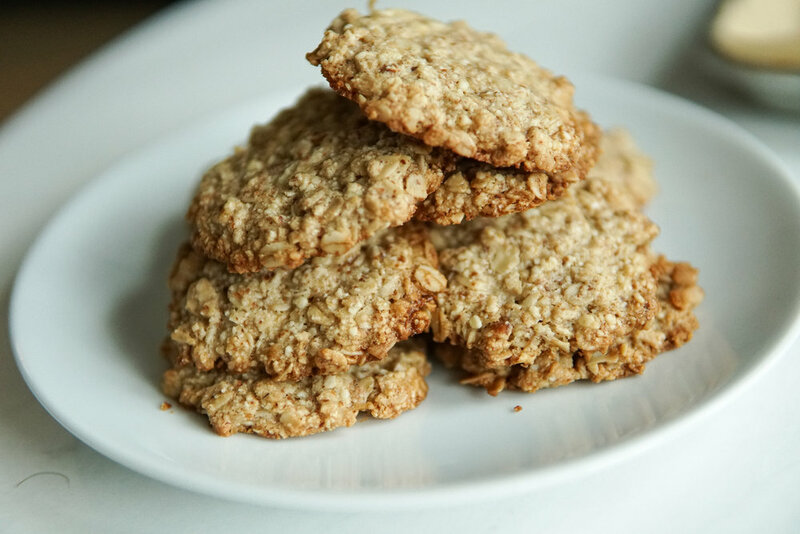 The most simple, delicious and healthy oat cookies EVER! It only takes 5 minutes to make the batter, 8-10 minutes in the oven AND uses only 5 ingredients that you probably already have! Bake them until the edges just start to turn golden brown, let them cool and then bite into the crispy edges and soft, maple oat center. I thought these up as I was enjoying a rhubarb crumble at home and straight up eating the crumble topping with a spoon hoping no one would notice. There's no way I'm the only one who does this, it's the best part! I honestly believe that the ratio of crumble to filling should be about 2:1...maybe 3:1. How do you make your own almond meal? I never buy almond flour anymore ever since I tried making it myself. 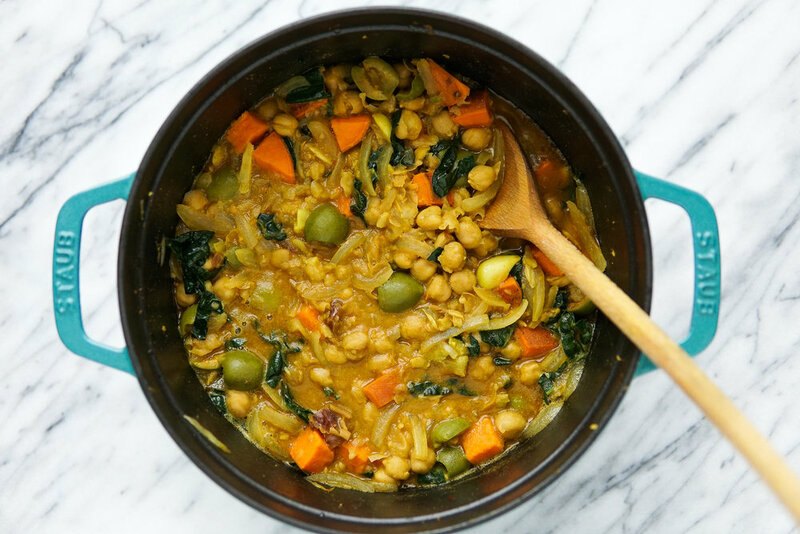 All you need is a blender or food processor and some almonds. Pulse until a fine meal starts to form. What's the difference between almond flour and almond meal? 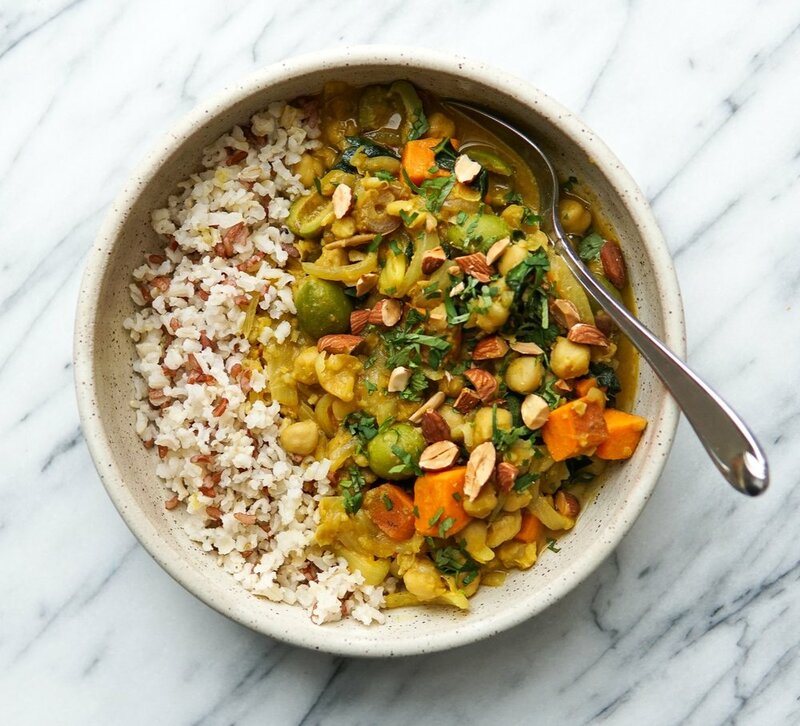 Almond flour is usually finer than almond meal and generally uses blanched almonds, meaning almonds that have been flash cooked so that the skins come off. Almond meal is the whole almond, giving you way more nutrition and fiber. What can I use to replace almond flour for a nut allergy? I always recommend that people try to use a seed flour in place of almond flour. You could try substituting oat flour or regular flour, but it will result in a much more dry cookie. Try pulsing sunflower seeds or pumpkin seeds in a blender or food processor until a fine meal forms. In a bowl, stir together the almond meal, oats and salt. Add the remaining ingredients and stir until a uniform dough forms. Scoop tablespoon-sized cookies onto the baking sheet. Use your hands to flatten them (they will not spread), making sure they keep their shape. Bake for 8-10 minutes, or until edges JUST start to turn light golden brown. Allow to cool for a bit so they hold together. 1. The cookies may not seem done, but will firm up as they cool. It's better to undercook them then overcook them, unless you like a super crunchy cookie. 4. These cookies make amazing ice cream sandwiches! 5. Double the recipe and freeze half for emergency cookies!